Plant partly creeping, with erect filaments up to 2 cm tall. Apical cells 100-200 µm in diameter, the lower cells up to 700 µm in diameter. Cell length up to 1.5 mm. Branching (outside reproductive structures) rather infrequent, intervals varying from every second segment to several segments. Filaments ecorticate. All reproductive structures in strongly condensed systems. 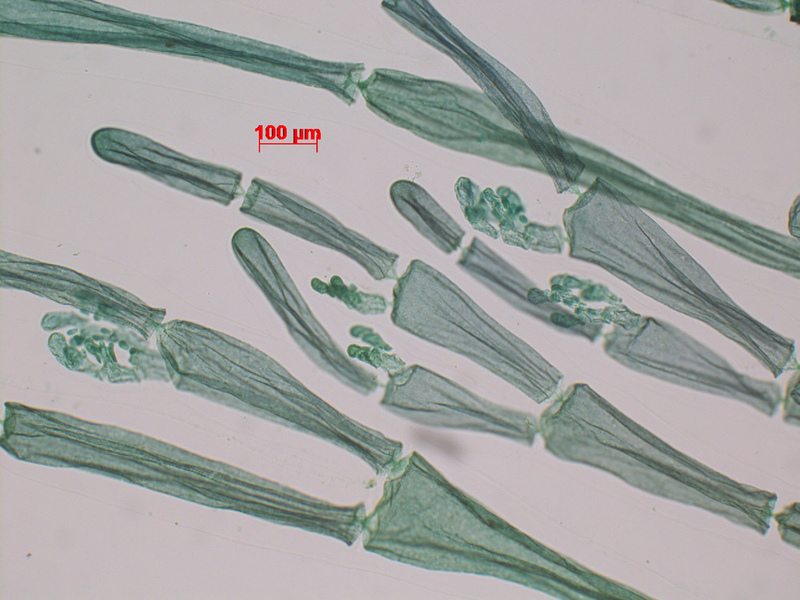 Tetrasporangia sessile, with a maximum of two (- three) per cell in the frequently branched system of up to 800 µm large, ca. 75-90 µm in diameter at maturity, tetrahedrally divided. 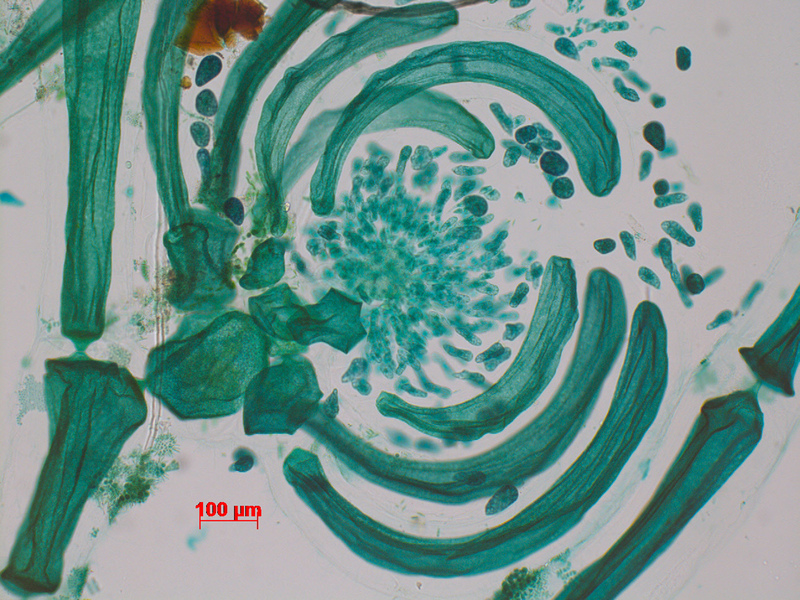 Spermatangial stichidia cylindrical, with a 5- or 6-celled axis, at maturity about 200 X 80 µm, strictly one stichidum per vegetative cell; the apical (vegetative) cells much longer than in the tetrasporangial stand. Carposporangial stands with strictly a single carposporophyte, the filaments of the involucre arising in three groups, the terminal cells elongate and curving around the developing carposporophyte, the whole structure ca. 1 mm in diameter. Carposporophyte with a massive cell fusion consisting of fertile axis cell, supporting cell, gonimoblast initial and proximal gonimoblast cells. 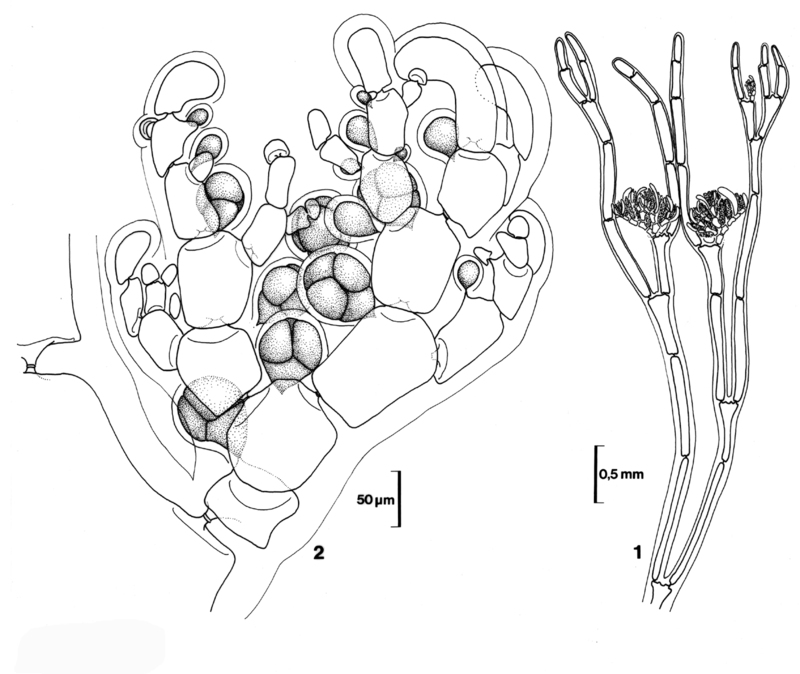 Only the terminal cells in the carposporophyte mature. Recorded from Swartklip, False Bay to northern Transkei (Mkambathi)(18-48). B. repens is found on the whole of the South African south coast and in the northern half of Namibia (Rull Lluch 2002), but is apparently absent from the S. African west coast and the southern half of Namibia. B. repens is usually an epiphyte but can be epilithic. World distribution: a southern African endemic. Note: The relationship to B. tenuis from the Natal coast (Norris & Aken 1985) remains unclear. Bornetia repens. 1. Thallus apex with clusters of antheridial heads. 2. Compact branch system with tetrasporangia. Reproduced from Stegenga et al. (1997). Bornetia repens. Young tetrasporangial stands (stained slide material, Vleesbaai). Bornetia repens. Tetrasporangial stands (stained slide material, Vleesbaai). Bornetia repens. 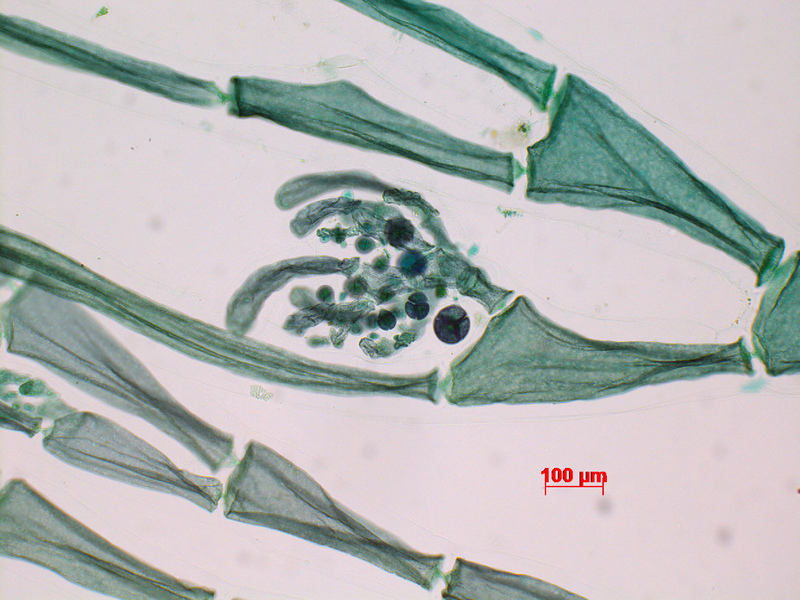 Mature carposporophyte (stained slide material, Vleesbaai). Stegenga, H. 1985. A new species of Bornetia (Rhodophyta, Ceramiaceae) from southern Africa. British Phycological Journal 20: 163-168, 10 figs.